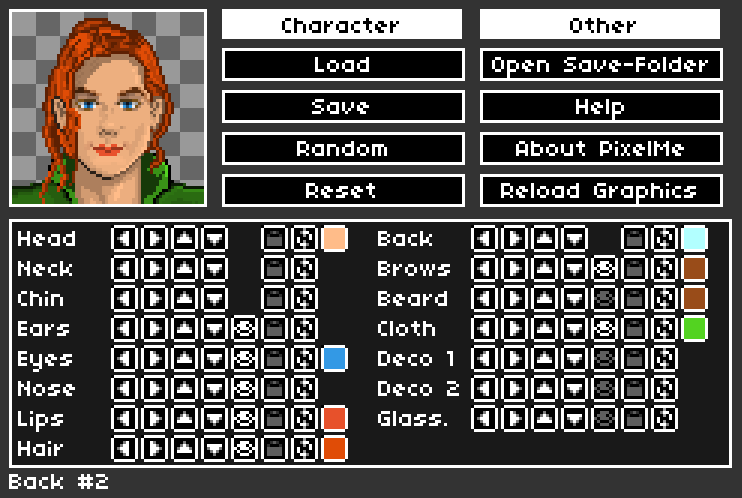 Pixel-Me is probably the most sophisticated pixelart character-generation tool for an almost unlimited number of portraits. 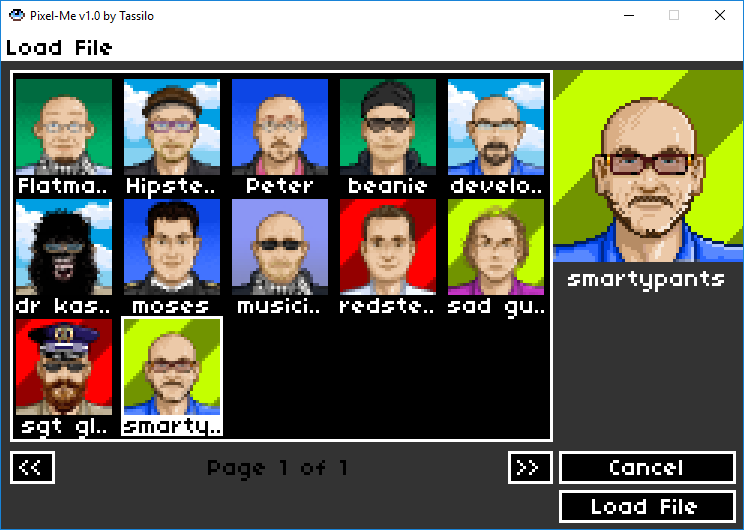 Create outstanding pixelart-avatars for your Steam account and social media profiles; create striking images of your friends and family or use it to depict your team or for ingame-artwork. During the last six years, I handcrafted hundreds of custom pixelart portraits, storing all the different parts created for these images. With a total now of over 700 elements like noses, beards, eyes and the likes this tool will allow you to create billions of diferent images of virtually any person. 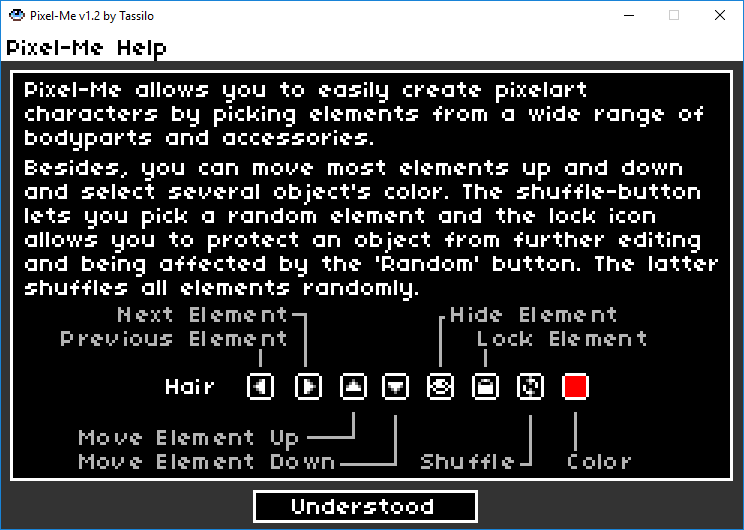 Random functions for the individual parts of the overall image will help you generate a wide range of different characters and most layers can be activated or hidden, corresponding to your needs. I expect to update the app every once in a while with new elements. The results are yours to use in any way, both personal and commercial. 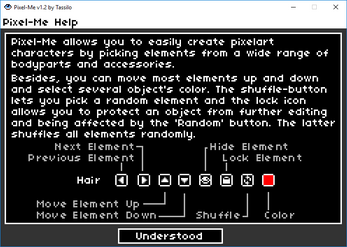 Files are saved as PNGs and editable Pixel-Me files. 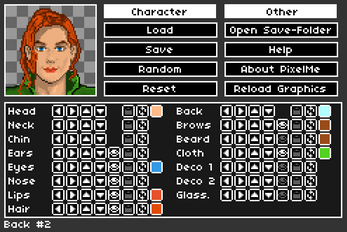 For the time being, Pixel-Me unfortunately only supports one specific skin tone. I am working on a solution for that. 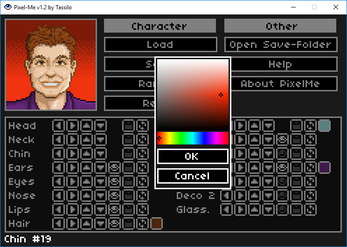 Pixel-Me v1.3 with skin-toning now available! 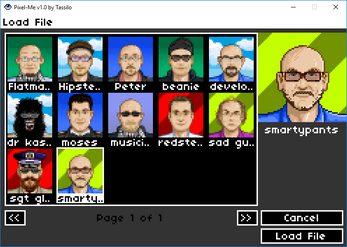 Pixel-Me v1.2 Windows available now! Hey, you should update your "platforms" list here to include windows. I almost didn't buy it because it said it was MacOS only! Oh my, thanks for pointing that out! I just toyed a bit with the tool and it's very responsive ... and I already have another request xD : it would be awesome if backgrounds were not mandatory. Unless I'm mistaken, I saw no option de "deactivate" the background. It would be cool to be able to have the character only without the bg. Also, beside my request for african chars, it would be cool to be able to "ajust" the colors of current chars , actually this would be very useful for a more accurate "rendering". That is something I've got very high on my list. I made some african portraits in the past, but had to do so manually. I am working on a solution to automate that for the app. I'll keep you updated! Trello is not open to be edited by the public, unfortunately, but I'll add your request right away. Thanks for the very fast reply. Sorry I have not noticed it before. I just tried to buy the software right now, but it is not letting me to. Is there another way to buy (that does not involve paypal or to pay you directly and get the key?). The visa card I have my money on seems not to be working with paypal at the moment. I just noticed that you are gonna realse this on Steam too. If I buy it now (because I really want to xD) , will I get a steam key when the steam version is out? (I'm kind of a steam junkie ^^). Yes, luckily itch.io offers support for sending out Steamkeys to existing users and I will happily use that. Glad to see you onboard! is it possible to make portraits of kids using this tool? That depends on the age. I'd say anything beyond 11 might work. However, I just added a smaller body to the Requests-list, as that might strongly enhance the childish look. Will try to add it to the tool ASAP. Will be considered for the next update. Thank you!